From its origins in 1981, the Society for Textual Scholarship’s journal has led the way in opening discussions in the field of textual studies. 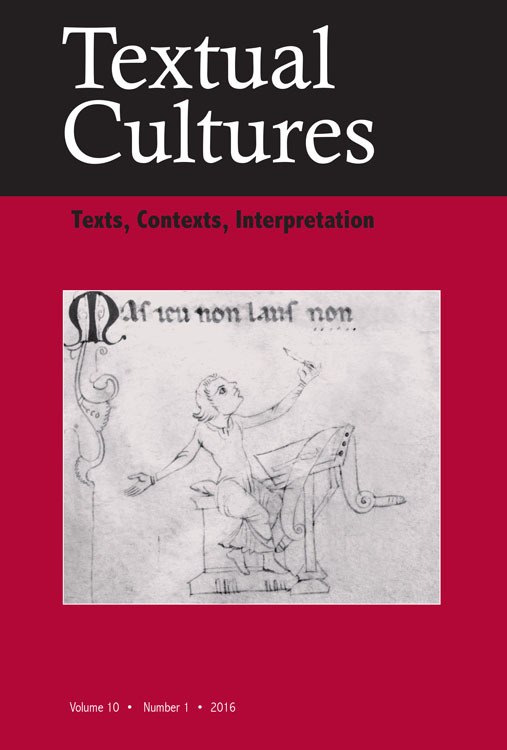 Since 2006 Textual Cultures has continued the tradition of TEXT with an ever more inclusive and multi-voiced approach to issues of textual editing, redefinitions of textuality and the diverse textual cultures in which these definitions and our approaches evolve. 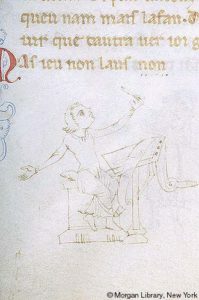 Textual Cultures: Texts, Contexts, Interpretation is devoted to essays on the praxis and theory of textual editing in all national traditions (texts). With the expansion of fields that define their study as the interpretation of “textuality”, the journal proposes as well an exchange between literary critics interested in the text and specialists devoted to the study of and preparation of those texts (interpretation). Between those who prepare editions and those who rely on them for their interpretations are numerous emerging and traditional fields of material studies that explore the production, reproduction and reception of texts in their often multiple cultural shapes, even within a limited intellectual domain, including cyberspace (contexts). Textual Cultures is dedicated to the far-ranging conversation waiting to take place in which the resources of scholarly studies into the complexities of cultural-textual settings that define and redefine a text can provide new perspectives and paradigms for the preparation and interpretation of texts and their contexts. 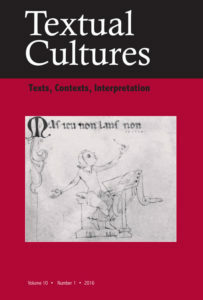 Front cover of Textual Cultures, vol. 10, no. 1, 2016. Textual Cultures publishes path-breaking, peer-reviewed essays as well as reviews of seminal works in the field. The editors of Textual Cultures will review all submissions for suitability to the journal’s mission. If the editors feel that the submission is indeed within the purview of the journal, it will be assigned, through a double-blind process, to typically two specialists in the field in which the author wishes to make a contribution. If the two reviewers disagree, the editors may decide one way or another or send the article out for a third review. Comments from reviewers will be reviewed by the editors and shared with the author, regardless of the decision to publish or not. General queries regarding works for review published in the North America, the United Kingdom and Australia should be sent to Marta Werner, Editor-in-Chief (wernerm@dyc.edu); Logan Esdale, U.S., British and Anglophone Book Review Editor (esdale@chapman.edu). General queries regarding works for review published in Europe, South America, Asia and Africa should be sent to Michelangelo Zaccarello, European Editor and Coordinator (michelangelo.zaccarello@unipi.it); Alvaro Barbieri (alvaro.barbieri@unipd.it); and/or Paola Italia (paola.italia@unibo.it). We encourage research librarians to list this journal among their library’s electronic journal holdings. As well, it may be worth noting that this journal’s open source publishing system is suitable for libraries to host for their faculty members to use with journals they are involved in editing. Copyright © 2019 Textual Cultures. Powered by WordPress. Theme: Spacious by ThemeGrill.